Kartikotsava of Shri Yalguresh( of the famous Yalgur of Vijapur district), who is the lord of seven villages, who crosses seven seas to provide his ashirwaad to his bhaktas, will begin on this shaalivan shake 1939 maagh month's third Saturday (date 03-02-2018). Preparations are in full swing for the Kartik Utsav 2018. Around 20000+ people attended the festival last year. Kartik Utsav will be celebrated by lighting up the temple with the help of deepas in the evening. VedaGhosh (Seminar on Vedas) by students of Maanikyanagar Sanskrut Vidyapeeth (Bidar). Shri Vaayustuti, sundarkand and samudvijay by Pandit Shri Prasannacharya katti. This will be followed by Bhavya Shobha Yaatre. by Kumar Padmashri Joshi, respected Raghottam Joshi, Shrimati Sangeeta Kaakhandki, Kumar Naagraaj Kulkarni, kumari Lavanya, Sneha mattu Prema Kadival, susvar balaga Shri G B Kulkarni. Nrutyarang(dance) by Shri Subhedha despande. Singing Jugalbandi by Shrimati Renuka, Shri Raghunath, Dr. Ravikiran Naokda . Singing, all night singing performances, cultural, daasvahini programmes by Bhumika, Akshat, Aranyakumar, Rajat Kulkarni,Shrinidhi Kulkarni, Sumati Joshi, Geeta Kulkarni, Mohan Kalburgi, Shri Santosh Gaddankeri, Vaishnavi Panchamukhi, Shrihari digbhavi, Veena Badiger, Veeresh Naagthan, Jayteerth Taasgaanv, Shri Raghavendra Gudi, Shri Sheshgiri Gudi, Shri Raghavendra Katti, Shri narayan taasgaav, Shri Rajendra Deshpande. After that Maruti Mahime Rupak and Yakshagaana performances by Shri Mahaganapati kala and sanskrutik (arts and cultural) Santhan (Udupi). After that early morning Pallike Seve, Kakkadaarti and bringing down of deepotsava Kartik. 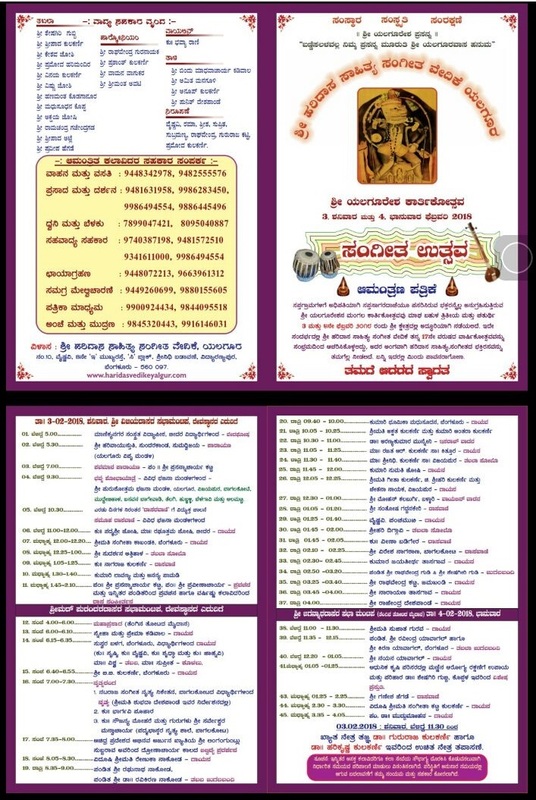 Singing performances, daasvani and Prasad distribution by Shrimati Sujaat Gurav, Pandit Shri Ravindra Yaavagala and Shri Kiran Yaavagal (Bengaluru) , Shri Nayana Yaavagal,Dr.Muddumohan Shri Ganesh Hegde and ,Shrimati Sangeeta Katti Kulkarni. Shri Yalguresh committee hereby invites the devotees to come and perform seva to Shri Yalguresh and take his blessings in the Kartikotsava.